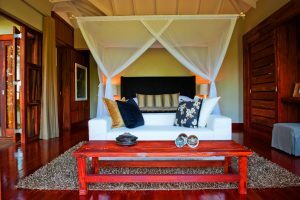 Lake Duluti Lodge is made up of 18 spacious, contemporary African styled, romantic chalets ideally positioned for maximum privacy and view inside a thirty acre active coffee farm located in a safe and exclusive area on the outskirts of Arusha. All chalets are positioned to face the coffee farm and each has a private deck with an amazing view of the ancient indigenous trees found in big number within the farm. Lake Duluti Lodge has been designed in a way that you will feel like you are staying at home rather than at a top end hotel. Lake Duluti Lodge prides itself on its finest cuisine, first class exclusivity, five star personalized excellent service, top class amenities and the eco friendly architecture and operations. The lodge is run by Lake Duluti Lodges & Tours, a Tanzanian company with a modern approach to delivering world class hospitality. The company’s mission is to consistently deliver the best of the first world’s luxury hospitality experience to all its guests.